Bit of a hardware hack required today as our vinyl cutter controller failed and we are having trouble finding a replacement. Hardware is an Arduino pro mini and 2 easydrivers, plus a big ol’ transistor scavenged from the old board for the blade solenoid. The original power supply is used which supplies 12v, 5v and 37v. 5v is ignored, 12v supplies the drivers and the 37v supplies the solenoid. The Arduino is supplied by the USB to serial adapter, this allows the motors and drivers to be turned of without having to try to disconnect and re-connect the serial port on the PC, which is a pain. Software is a simple gcode sender to send the data to the and a laser output plugin for inkscape (speed set to 1000). Firmware is GRBL. I need to tweak the GRBL settings as it runs a little slow between curves so judders on complex shapes but so far the accuracy is fantastic. 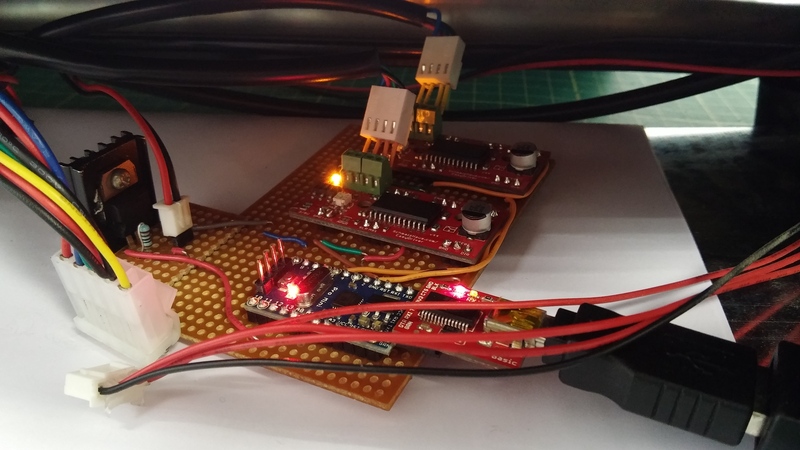 Onboard USB/Serial adapter – try to use the board that is in the machine. Screen / control panel – now redundant – find something interesting to do with them.